Hello and welcome back to my blog. I have been a little quite for past couple of days. That is because I am in Malmo in Sweden at the moment. My husband and I are travelling. We were in Denmark until Sunday and then travelled to Sweden in the evening of Sunday. Its wonderful and so beautiful here. Soaking it all in. This Monday morning, I found the time to write up this blog post. I have couple to cards to share using Altenew’s new Botanical You stamp set and coordinating die. These products are from the latest May release. 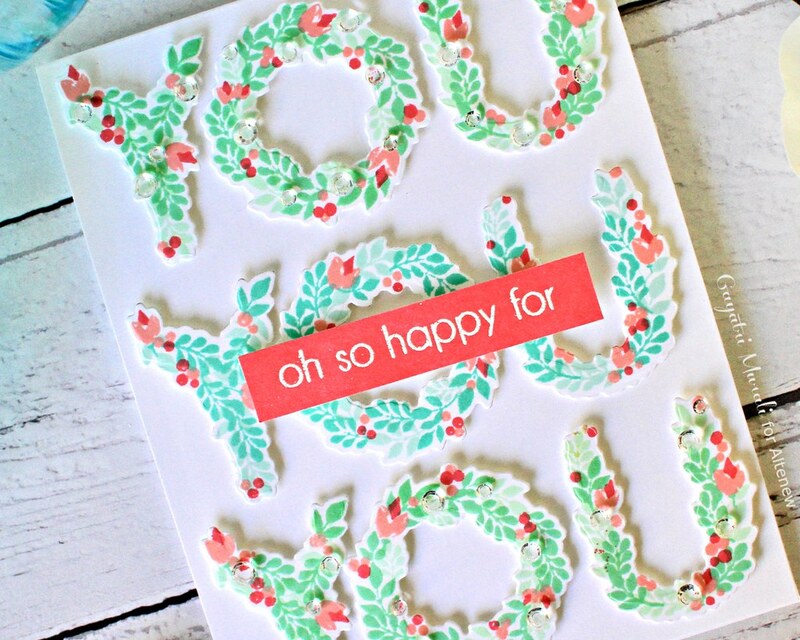 This is a layering stamp set but so easy to work with. The back of the stamp set has a guide to show you how to layer the stamp set. It is super easy. Here is my first card. For this card, I used two set of inks to stamped the first two layers. For the top and bottom YOU, I used Minty Mint and Sweet Leaf inks from Green Meadows ink set. For the middle YOU, I used Mountain Mist and Volcano Lake from Sea Shore ink set. 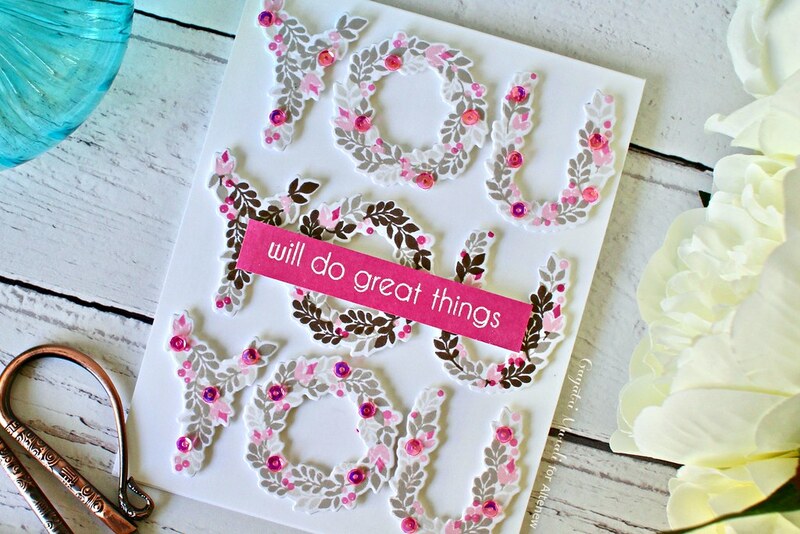 For all the flowers on the YOU, I used Pink Pearl and Coral Bliss inks from Tea Party set. I used MISTI to stamp the layers on Neenah Solar White 80 pund cardstock.. You can definitely use acrylic blocks as well. Then I used the coordinating die cut to cut out the YOUs. On the white card base, I arranged the die cut and adhered then using foam adhesives. 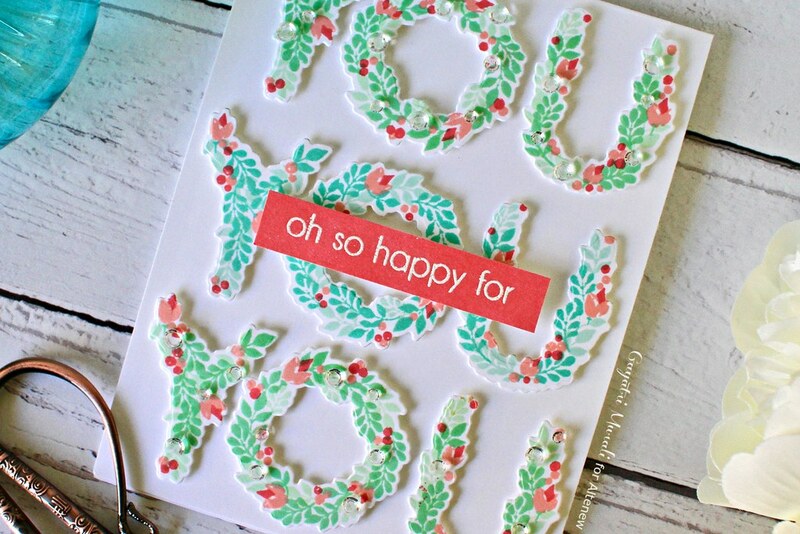 The smaller sentiment is also from the same Botanical You stamp set. 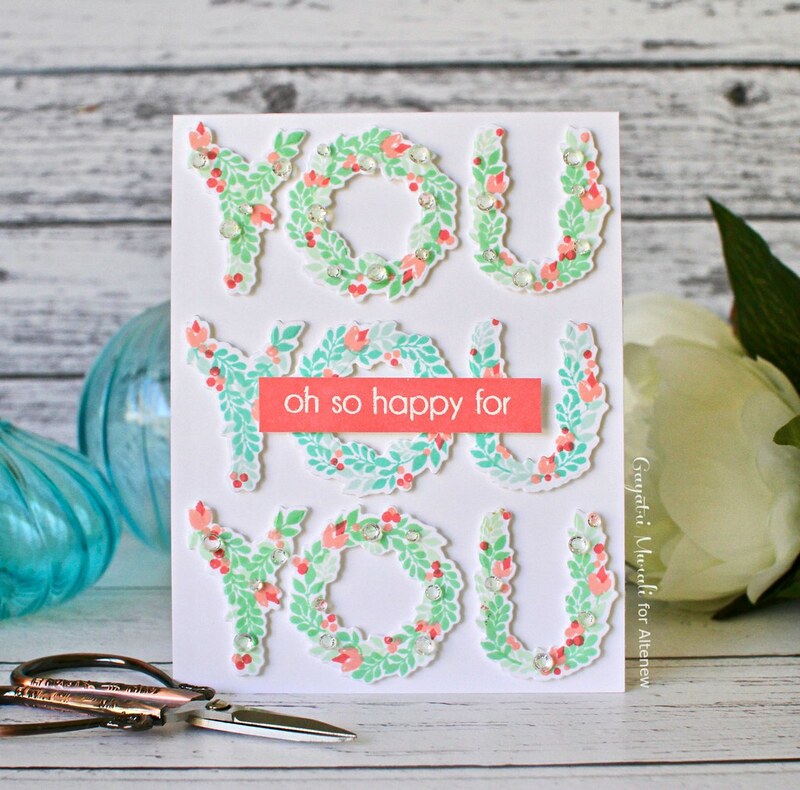 I white heat embossed it on a strip of white cardstock and sponged the strip with Coral Bliss ink to tie in with the buds/flowers on the YOU die cut. This strip is adhered on the centre YOU using foam adhesives. 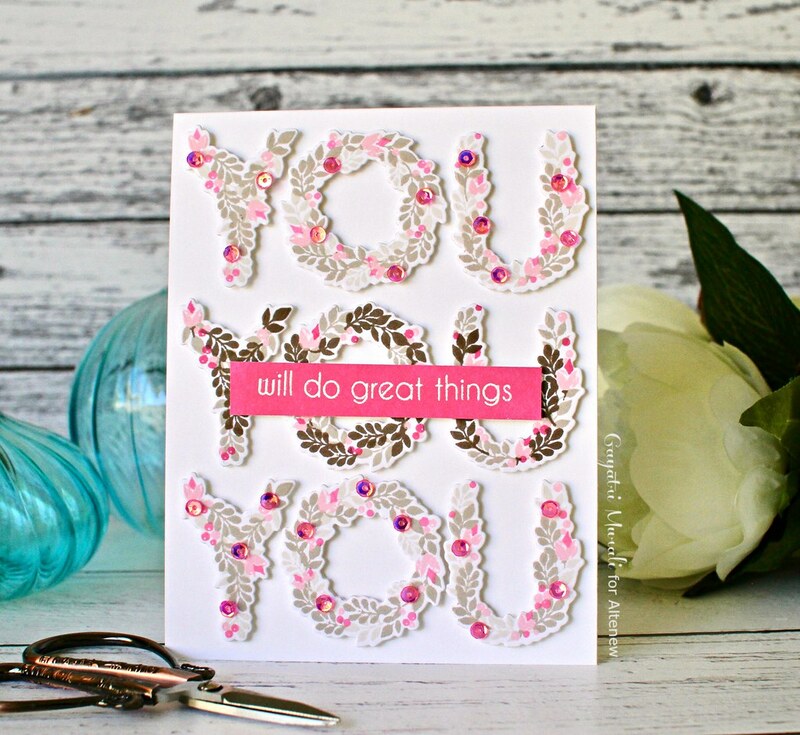 I used a few diamonds from Little Things by Lucy to embellish the card. Here are some closeups of the card. 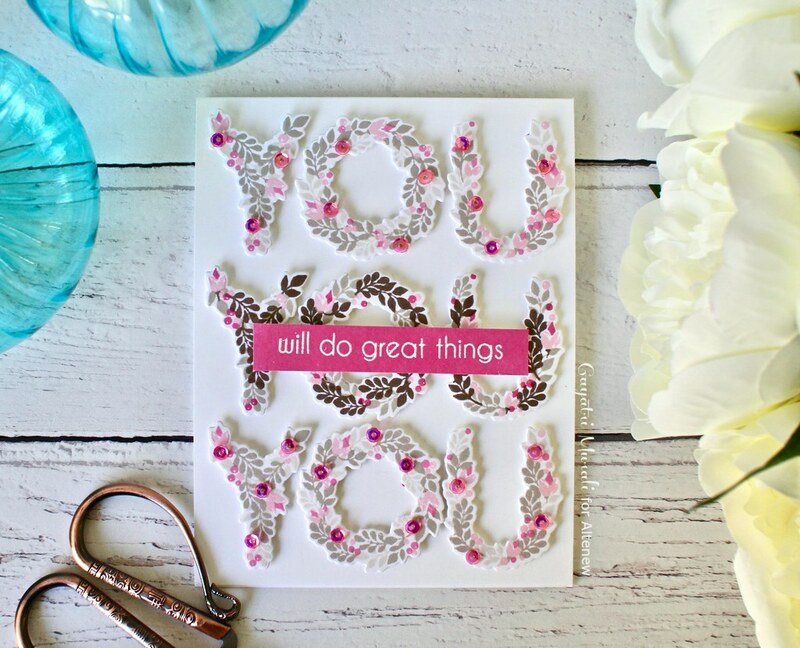 The size of the stamped die cuts are large enough to fit in the card’s width and thrice vertically as shown. All supplies I used to make this card I will list below after the second card. For the second card, the layout and design of the card is the same. I only changed the colours and embellishments. I used warm grey ink set on the foliages and Cherry Blossom ink set on the flowers. For the top and bottom YOUs, I used Morning Frost and Evening Grey inks and for the middle YOU, I used Evening Gray and Moon Rock inks. For the flowers, I used Pink Diamond and Pinkalicious inks. 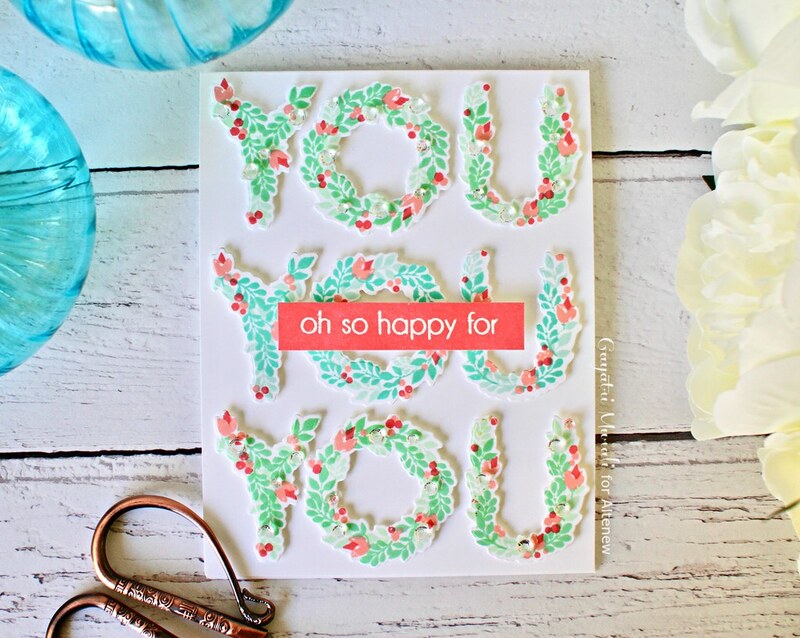 The secondary sentiment is also from Botanical You stamp set which I white heat embossed on a strip of white cardstock and sponged with Pinkalicious ink. 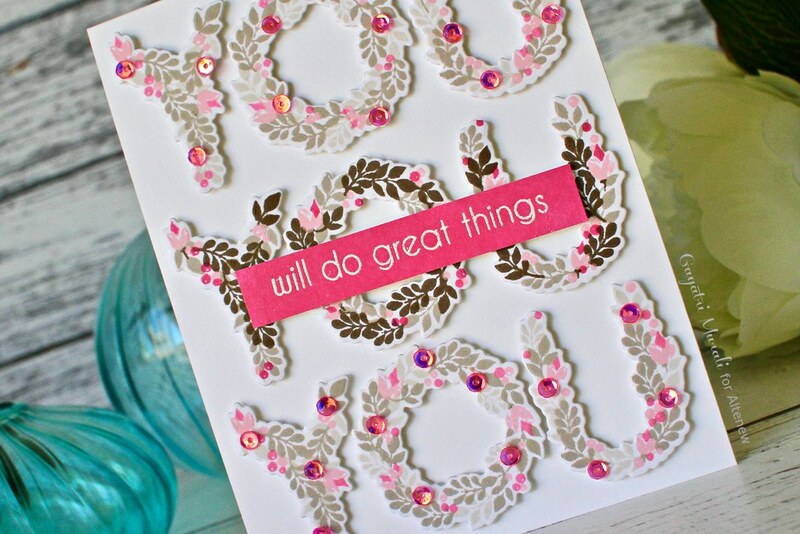 Here I used Pretty Pink Posh Strawberry Burst sequins as embellishments. Some closeups for you. Out of the two cards, I personally love this gray and pink. Just something different in terms of colours. I like to do unconventional things here and there as an element of surprise or different. Here are all the supplies used to make both the cards.